Not researched any further but this may well go on the wish list. Guy, you must have the shortest wishlist ever. You see something ... then BAM, it's on your wrist! 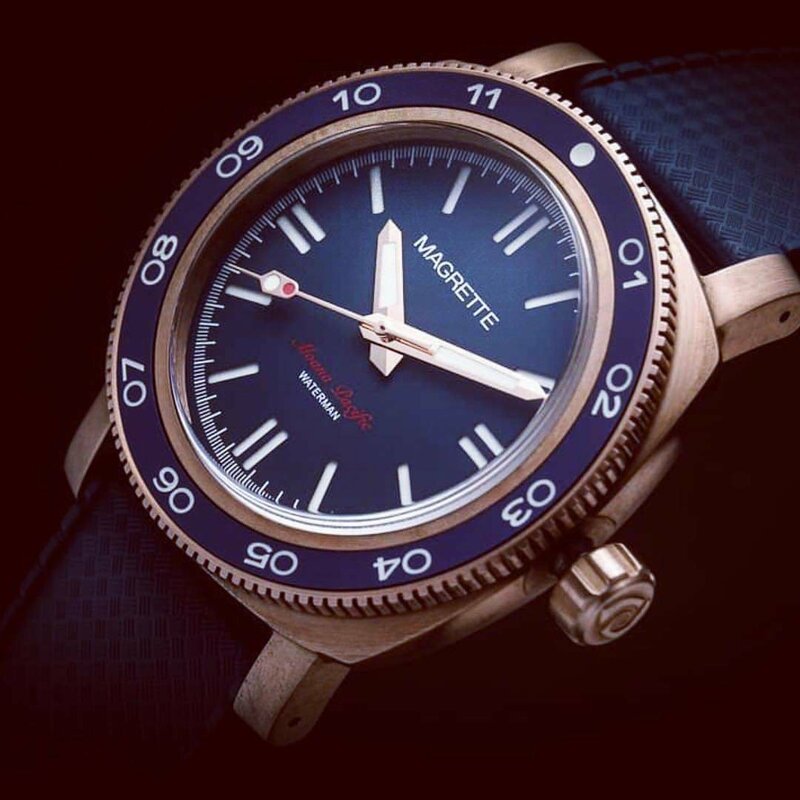 The Magrette Waterman in bronze with blue dial and bezel inlay. The blue is a bit more prominent than visible on this picture. Think the blue of the Kara model. It looks very nice. I have four bronze / brass watches, so I'm a fan of the genre. 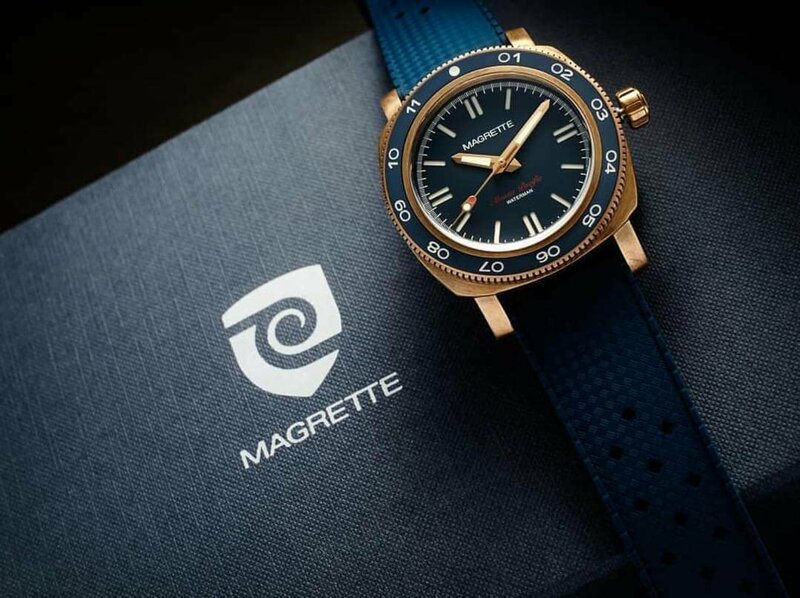 The fact that Magrettes case design, means more of the bronze is exposed, even with the bezel inlay, is a bonus as well. One to keep an eye out for. 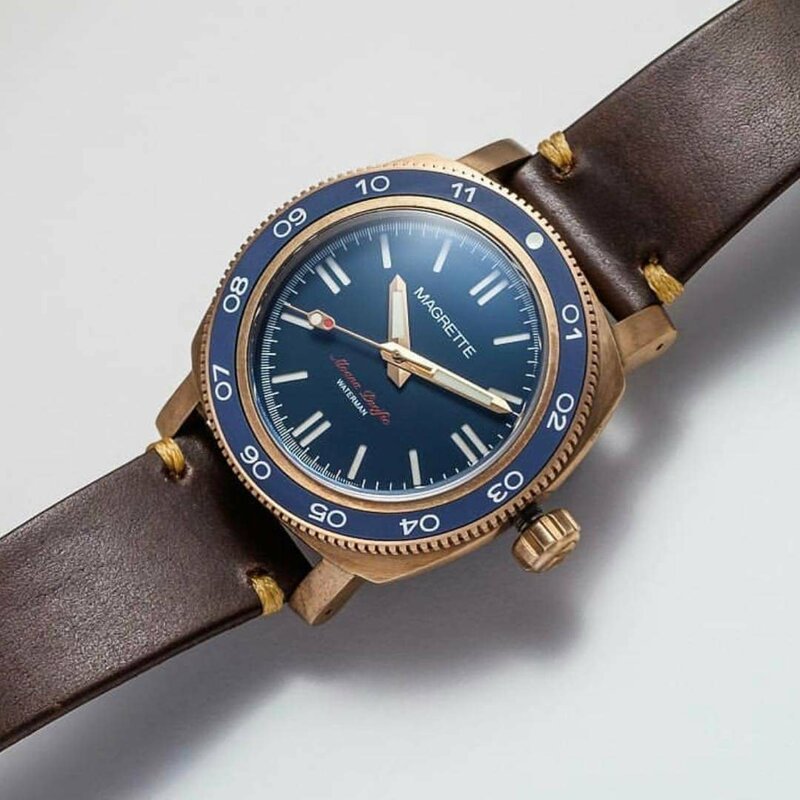 Magrette Waterman in bronze. Full details in 6 days. I quite like this. However, I'm hesitating because I was slightly disappointed by the Kara in the metal compared to the pre-order photos, so I'm wary of going on photos alone. In particular, the bezel and strap blue were nice but the dial was a far lighter blue in person that did not match. If this is the same blue, I'm not sure it will work, but I hope to be proven wrong! baldrick wrote: I quite like this. However, I'm hesitating because I was slightly disappointed by the Kara in the metal compared to the pre-order photos, so I'm wary of going on photos alone. I get what you mean about the differing appearance of the blue on the Kara; looks that way to me too. However, I feel that the colour is the same but due to the different surfaces, on the dial vs. bezel, it is applied to it looks different. In the meantime, a further teaser from Magrette / FORaSEC. This is one damn fine looking watch. 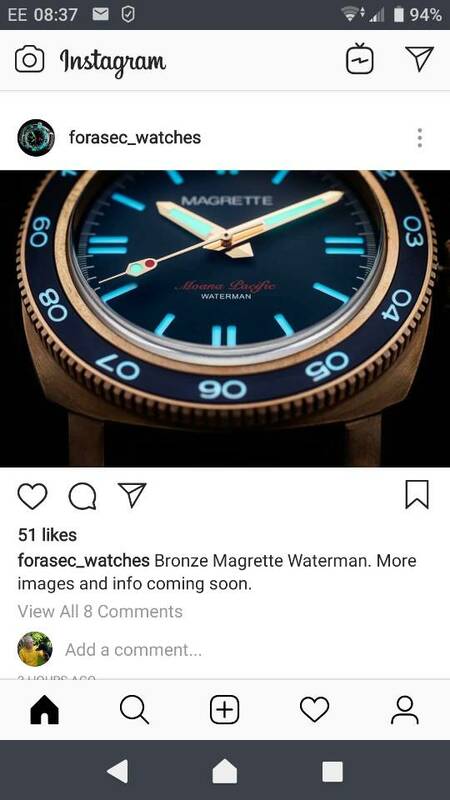 I'm wondering if Magrette will continue to use a Miyota movement for the Bronze, as in earlier Watetman, or switch to the newer STP as used in the Kara. 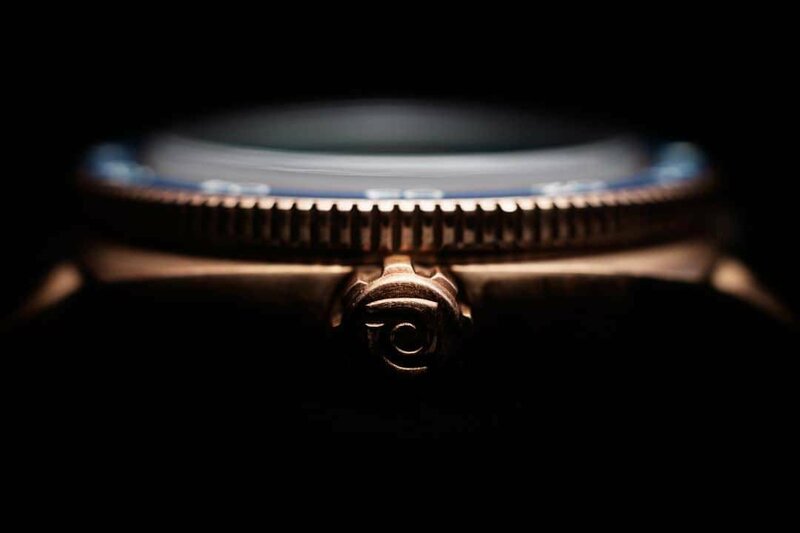 Think one of the most attractive bits about this watch is the thin band of Bronze between the bezel inset and the crystal. 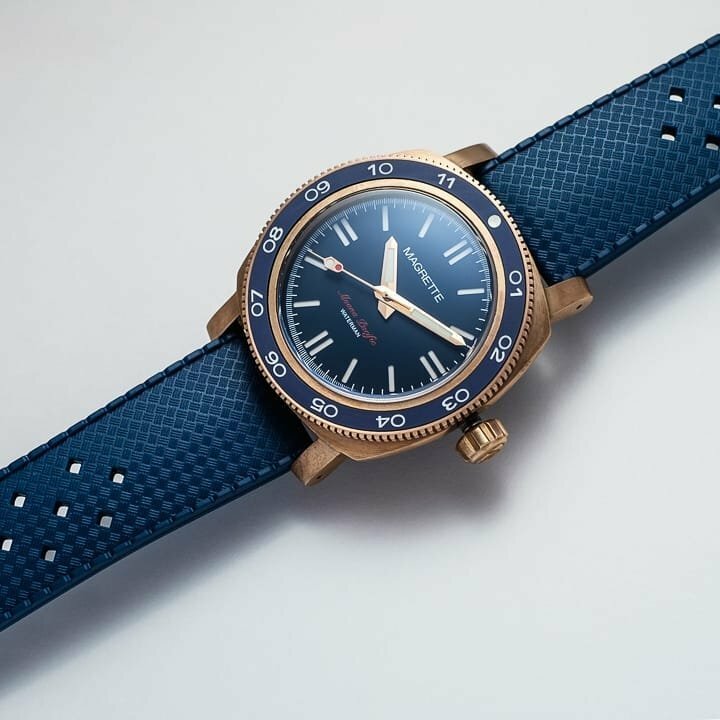 Funnily enough that's one of the things I really like about my planet ocean - a thin steel band (offhand I can't recall if it's part of the bezel or insert) that frames the black dial and gives a sharp contrast. @gaf1958 - interesting point Gary. The first photo that FORaSEC posted was a side on shot that may have shown the case depth. However, it doesn't show us enough.